Budapest, Thursday: Bob Stensholt, himself a member of the Victorian Parliament, albeit of the Labor persuasion, advises me of the death last month of former patrol officer Harley Dickinson at the age of 70. Harley was educated at Geelong College and the Australian School of Pacific Administration. He pioneered the exploration of Mt Fubulan in PNG in 1958 as a patrol officer. From 1958-70 he served respectively with ranks up to district officer. The Victorian Parliamentary record of his subsequent career seems to me a little confused but I quote it verbatim: “Officer Papua-New Guinea Constabulary, Office of Programming and Co-ordination 1970-1971; officer OK Tedi and Bougainville copper projects, Department of Law 1971-1976; resident magistrate, visiting justice and coroner Boroko, Popondetta and Mendi district courts, district supervising magistrate Southern Highlands Province, chairman Highland District Land Disputes committee”. Harley returned to Australia in 1976 as assistant secretary of the Victorian Chamber of Manufactures. In 1982 he was elected as the Liberal Member for Barwon in the Victorian Parliament, holding the seat for more than ten years until his defeat at the 1992 election. Vienna, Tuesday: In Papua New Guinea, Newman Ewada is trying to establish the identities of those Europeans (non-Papua New Guineans) who were killed in the Mount Lamington eruption of 1953. Australia’s development aid program in Papua New Guinea is set to approach one billion kina in 2008-09. The budgeted spend of K973.2 million represents an increase of more than K83 million over this year. “On top of this, PNG will also have access to a significant pool of regional funding,” says Margaret Thomas, AusAID head in PNG. The budget includes additional allocations of K33 million for infrastructure, K15 million for education, K15 million for governance and K6 million for health. Improved governance and nation-building will be supported by programs covering economic and public sector reform, law and justice and border security. The struggle against HIV/AIDS, a pernicious influence in PNG, will be supported by a K250 million five-year program. Despite frequent offloads by Air Niugini, The National continues to be PNG’s best-selling newspaper for the first quarter (January-March) of this year. ccording to the latest report released by the Audit Bureau of Circulation (ABC), the average daily circulation of The National for the period was 26,450 copies, ahead of the Post-Courier which recorded 25,799. The National overtook Post-Courier in the second quarter of last year to become PNG’s nambawan newspaper with an average daily circulation of 29,706. ABC said that during the same period, Post-Courier’s circulation was about 4,000 copies less. In the third quarter of last year, during which PNG held the general election, The National increased its circulation further to 30,632 while the Post-Courier also increased to 27,488. The National relies entirely on Air Niugini and road transport operators to deliver newspapers outside of Port Moresby and Lae. The newspaper is frequently offloaded by Air Niugini along with other cargo, and the late arrivals have impacted on circulation, particularly in the past few months. In the urban centres of Port Moresby, Lae, Mt Hagen and Goroka, The National continues to be the more popular paper. The Office of Australian War Graves is trying to find out if there are any official or private war memorials in Bougainville for which the Office could take over maintenance. The Office knows of one substantial Australian memorial on Sohano Island, erected between 1945 and 1954. The memorial features a combined service emblem. Joe Filippi, president of the PNG RSL, has asked ASOPA PEOPLE readers if they may be able to provide advice on war memorials on Bougainville, or add to knowledge of the Sohano memorial – that is, exactly when it was constructed and by whom? You can contact Joe by email here. can provide a solution, one must define a problem. So what's the problem? from the standards we set when we ran the place. disconnected with the people they initially set out to help? is because it worked (and I believe worked well), while we were in charge. The answer to this apparently complex problem is I believe, very simple. collapse of the field service and the structure of government for the country. history but we can learn from it. just our nearest neighbour we might have an easier time of helping her out. political influence, rather than to direct these funds to essential services. population coupled with an equally rapidly increasing AIDS epidemic. affluence, however that hasn't always stopped takeovers in the past. now the current Australian generation ought to be able to, as well. key to a better life in PNG may start with this essential ingredient. bilong opim doa igo long nupela rot istap long dispela tingting." the people of Papua New Guinea. Prague, Wednesday - The weather remains dour, all the better for energetic walking, but the beer is as good as ever. It's also pleasing to see the name Budweiser back in the ownership of the country where it belongs. If you have read Liz Thurston's letter to the Prime Minister [below] about the Montevideo Maru, I think you'd agree that the she offers is both intellectually compelling and emotionally engaging. Indeed, it strikes me that it would take a very flinty heart and a very closed mind in the Office of the Prime Minister to flick a letter like that into the tray marked 'Stock Replies Only'. Perhaps it will be a measure of what we can expect from the (relatively) new Rudd Government when we learn how Liz's letter has, in fact, been handled. That's by way of introducing the substance of today's note: which is, when it comes to matters of public policy or national endeavour, each of us can make a difference. Putting pen to paper, or fingers to keyboard, remains a worthwhile enterprise. For example, I know there are many matters that would concern all of us about present day Papua New Guinea. Whether it has been benign neglect, bordering on indifference, by the Australian Government over recent years to very difficult issues around governance, corruption, health, education, infrastructure and crime in PNG. I do not believe any of us who spent time in that country, and who built close relationships with its people, would feel anything other than a sense of profound sadness for the lives of Papua New Guineans which are blighted, especially by the degradation of public services. Now the last thing we ought to be is patronising about such matters. But I do think we ought to have a view. I do think we should be engaged. I do think we need to articulate a position. And I believe we must do something. The first step along the way might be to decide how best that ordinary Australians like us (albeit extraordinary in the sense that we care for PNG and its people) ought to be responding. I'd like to hear your views. You can post a comment below or you can email me using the link under my photo at left. Yes, we can all make a difference. But it will first take that minimal effort of thinking through what action might be proper and appropriate and meaningful. There are many things already happening - from doctors spending their leave in rural health centres to shipments of books and materials for PNG schools. People like Norm Richardson and Paul Oates are coming up with great ideas to strengthen relationships between PNG and Australia. But can these efforts be better organised? And what more can we do? Your observations and thoughts will be taken seriously and we'll also commit to taking them further. Over to you. The recent discovery of the HMAS Sydney has given Australians an overwhelming sense of collective relief and closure for what was a great wartime tragedy. For those families who lost loved ones, there is finally a sacred site to be honoured as an international war grave. Their long wait is now, thankfully, over and even though they will continue to grieve they have the comfort of resolution. That is not yet the case for the surviving families of those 848 troops and 208 civilians who are listed as missing on the Montevideo Maru after it was torpedoed off the Philippines on 1 July 1942. It was the greatest maritime disaster in Australian history. With the finding of the Sydney there is now a passionate determination among those of us who have family listed as missing on the Montevideo Maru to experience a similar sense of closure. We have been extremely heartened by your positive response to requests to locate the vessel, and we are enormously appreciative of the dedicated effort of a few people to bring this great wartime tragedy to the attention of the Australian public. Mr Albert Speer, MBE, has been particularly outstanding in his efforts to find more answers than questions to the fate of those 208 civilians captured by the Japanese in Rabaul and, allegedly, taken aboard the Montevideo Maru He has worked tirelessly, and at his own expense, on behalf of the families and all Australians to try and reconcile the inconsistencies and discrepancies surrounding this tragedy. 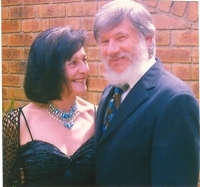 The prominent historian, Professor Hank Nelson has contributed years of scholarship to the topic and others have sought to publish their research. But, surely, it is now time for the government to step in and help shoulder the burden, carried to date by only the families and a committed few. My uncle, Henry Fulton, crippled by polio as a child, was working in Rabaul for Burns Philp when captured by the Japanese. His name is on the nominal roll as missing on the Montevideo Maru. He had gone to New Guinea to join his brother – my father – in 1937 and to begin a new life in the beautiful town of Rabaul. The tragic irony is that because of his physical disability, Henry was unable to enlist with his three brothers, Ted, Jack and Frank. Yet he was the only brother never to return. My father, Ted, was on the first troop ship bound for the Middle East with the Sixth Division: after the desert and Greek campaigns, the Sixth was sent to New Guinea and Ted was transferred to ANGAU because of his pre-war knowledge of the country. He spent many months behind enemy lines unaware of Henry’s fate. Jack was on the Burma railway and in Changi and Frank was with the RAAF. Like many other Australian families, mine gave so much to the service of this great country. Just a line to let you know that I am safe and well and am still in Rabaul, and I hope that you and Mary have not been worrying about me. I am in good health and am eating well and sleep well at night. I hope that this will find you in good health, and that Chris and the children are all free from sickness. Assure Mary that I am quite alright and also give my regards to Grace. I often think of you all, also Jack and Ted. Love to all, old Scout – and I hope it will not be long before I am seeing you all again. We have marked Henry’s too-short life by a plaque that sits on his parents’ grave at Waverley Cemetery and overlooks his beloved Bronte beach. We have his last letters, a telegram from the Australian government (dated 30 Oct. 1945) to my aunt, and a few black and white photos of a slight and wistful young man…. I realize that hundreds of Australians share unresolved and inherited grief of never knowing the true fate or final resting place of brothers, sons, husbands, fathers and uncles lost in the tragedy of war. While we will probably never know exactly what did happen to those 208 civilian Australians, most of whom considered themselves ‘Territorians’, it is accepted that the 848 troops from the 2/22nd Battalion were on the Montevideo Maru when it was torpedoed – and in all likelihood, many of the civilians were, too. I believe it is the responsibility of the Australian government – and not just a few dedicated individuals - to pursue every avenue of enquiry about the fate of those 208 civilians and 848 troops. Locating the vessel would, at the very least, bring a sense of relief to all the families involved. Not only would it validate the final resting place of those believed to have been aboard, its symbolic importance as a place of remembrance for ALL whose fate was sealed by the Japanese in Rabaul cannot be under-estimated. Sixty-six years of rumour, mystery, uncertainty and obfuscation have not diminished our resolve to find some closure to this sombre chapter in our history. 1. Since we have the technology to precisely locate the position of the ship, it should now be given the same priority and funding as was given to the HMAS Sydney. 2. The dedication of a memorial bearing the names of those civilian POWs, who were listed as missing on the Montevideo Maru and whose families were notified accordingly. The Ballarat memorial lists the names of the members of the 2/22nd Battalion, but not those of the civilian POWs. 3. The enormousness of this wartime tragedy ought to be given its rightful place in our history books and due recognition in all future ANZAC Day commentaries. It is shameful that so few Australians have heard of the Montevideo Maru. Prague, Monday - I couldn't make up my mind about whether to categorise the bizarre episode recorded in the following documents as Sport, Events or Nostalgia, finally opting for the conservative and safe choice of History. If nothing else, it reminds us that Papua New Guinea offered up some strange characters - and peculiar incidents. 22 October 1958. Universal Children’s Day. GT Roscoe instructs schools to arrange an appropriate celebration. Prague, Sunday: After braving the perils of Heathrow Terminal 5 and surviving with a delay of a mere two hours (a bagatelle compared with suitcases in Capetown), Ingrid and I are ensconced in the Czech capital for a few days and coming to terms with the local Internet, where nothing is as it seems. Una Voce editor, Andrea Williams, writes that Childfund Australia gave cameras to PNG children aged nine to 14 and the resultant photographic display is on in Sydney until this coming Friday. 'Through Children's Eyes' is a photographic exhibition showcasing a striking collection of photographs taken by children living in the Central and Gulf Provinces of Papua New Guinea, and children from rural communities in NSW and other eastern states of Australia. A video montage of the project, the children and their communities is shown alongside the photos as part of the exhibition. The documentary was put together by multi-media producer Max Campbell, head of the media unit at the Central Gippsland College of TAFE in Victoria, and film maker Bao Waiko, a mixed race Australian/Papua New Guinean who lives in Port Moresby. You can view the video here. The children from PNG were nominated to take part in the project with the assistance of local school and community leaders. 'Through Children's Eyes' is open to the public and free to attend at the Sydney International Cultural Centre, 72 Erskine Street in the city. Gallery opening hours: Monday - Friday: 11am - 6pm. Ingrid and I are off to Europe for six weeks – eastern Europe and the Baltic our focus – and, as you might imagine, keeping in close touch with the people and events that drive this blog becomes a little more difficult. This is where I rely on you – the reader - to contribute news, stories, reminiscences, opinion and other notes from your rich tapestry of PNG experience. You can reach me through the Email Me tag below my photo at left. I’ll be checking in each day to see how well you’ve done! My next post will be, I hope, from Prague. 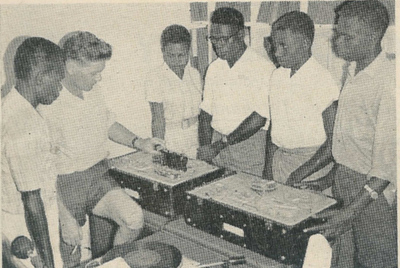 1959 - The first short course (orientation) for experienced teachers seconded from Australian states to teach in PNG for two or four years was held. Although I don’t know the numbers there was quite a group of us combined with a group of first time Cadet Patrol Officers. I missed out on a lot of after-hours fun as my home was in Sydney and I didn’t live in with the rest of them in the guest house down the road. I successfully applied for secondment from NSW after training at Bathurst (1953-54) and spending four years teaching in a one teacher school at Pine Ridge. I spent one year at Henganofi and two years at Kundiawa, both in the Eastern Highlands. Also met my wife of 46 years, Ruth, at Kundiawa, where she was a teacher at the Lutheran Mission. We have lived in South Australia since we returned to Australia. I wonder could I put out a call for information on a missing friend. 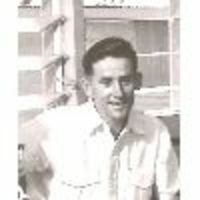 Frank Hiob trained at Bathurst and ASOPA and then taught at Goroka Technical School but went finish in January 1961 after we had done a trip to Dutch NG, Singapore, Bangkok and Hong Kong. I believe he returned to PNG later while I returned to Australia at the end of 1961. Have lost touch with him. Keep up the good work. The blog is certainly interesting reading and a vital link with the ‘good years’. The Papua New Guinea Association of Australia (PNGAA) has asked Australian Prime Minister Kevin Rudd to commit the Commonwealth Government to an expedition to locate the last resting place of the Montevideo Maru and the men she carried. The sinking of this vessel in the South China Sea off the Philippines in the early hours of July 1, 1942, claimed the lives of 1,053 Australian troops and civilians who had been interned in Rabaul. It remains Australia’s greatest ever maritime disaster. The sinking of the Montevideo Maru has special relevance for anyone associated with Papua New Guinea, PNGAA president, Keith Jackson said. From 1969, David Keating spent three idyllic years on Karkar Island. It was his first posting as headmaster and he’d started the high school. It had been a very productive time in his life. Now it was April 2008. The ship had anchored off Karkar and David and I were first to clamber down the steps to the waiting Zodiac. On the beach, planters Paul and Barbara Goodyear waited to take us to the high school. David asked to go via the now little used airstrip, where, before the South Pacific Games, he used to train for the 800 and 1,500 metres. Principal, Ben Tamilong, also welcomed us. He was an ex-student of the school, and in his speech he announced the new library was to be named ‘The David Keating Library’. In response, David reminded the Board of his early history on Karkar. Together with the villagers, he spent two months building the first bush materials school. “Difficult times create strength,” he said, “there are benefits from having to overcome adversity”. Meanwhile, the school had assembled on the front lawn. Clothes, all colours of the rainbow, greeted us. A stage with intricately carved posts had been decorated with palms and flowers. The 620 students sang the national anthemand pledged themselves to PNG. After speeches by Ben Tamilong and Ken Fairweather, a representative from David’s first class, Kubul Kakema, spoke. He’s now a teacher at a Kudoka Primary School. He described how frightened of David the students were. “He was the best Headmaster of this school,” he said. David said how pleased he was to be visiting the school he started in 1969. 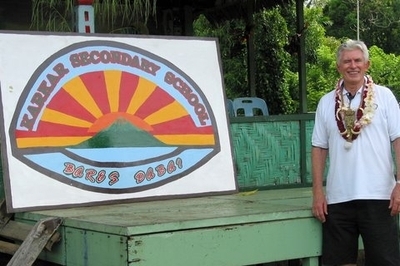 He was delighted the school logo and motto were the same. He reminded them why the motto was selected. ‘Bares Dabai’ [‘Strength in Unity’] triggered an eruption of delighted laughter from the students. As we walked towards the sports field with another of David’s legacies, the athletic track, we passed the Manual Arts Block. Outside was a huge sign: ‘Ba Dave Keating. Welcome to Karkar Island. Pioneer Headmaster of Karkar High School’. ‘Ba’ means ‘Father’, a traditional honorific for someone of distinction. Another surprise on a day of surprises! That evening, back on board ship, we were asked to talk to the other passengers about our day. They were interested, amazed and probably a little envious. Many expressed an interest to assist with donations of books for the Library. Exhausted, but too excited to sleep, we tried to unwind. We finally retired after midnight! Last night’s Commonwealth Budget provided a grant of $356 million to Papua New Guinea in 2008-09 and is supplemented by a range of programs focusing on infrastructure development, land administration and public sector capacity building. “The new package of measures contained in this budget will sharpen the focus of Australia's development assistance program on practical development outcomes and improved quality of life,” according to Duncan Kerr [left] the Parliamentary Secretary for Pacific Islands Affairs'. The Government says the new Pacific Partnerships for Development outlined in the Prime Minister’s March Port Moresby Declaration will provide a framework for Australia and Pacific island nations to jointly improve development outcomes. In addition Australia will invest $107 million over four years, with $6 million this year, to strengthen public sector administration in the Pacific. This funding will support management and policy reform and help to improve service delivery. A new ‘Better Governance and Leadership’ initiative has been allocated $41 million over the next two years to improve leadership. This includes a Pacific Leadership Program overseen by a panel of eminent regional leaders. The funds will be used for civic education and raising awareness about government accountability. In addition, the ‘Pacific Land Program’ will spend $54 million over four years to protect customary land rights, promote economic and social development and reduce the potential for instability as a result of land-related conflict in the Pacific. Around 14 October 1958, the new PNG Director of Education, Geoff [GT] Roscoe, took himself off to Canberra to see Territories Minister Paul Hasluck. He carried with him a detailed outline for a submission to introduce universal primary education in the Territory. Not trusting the Department of Territories, nor the PNG Administration, Roscoe did not show his paper to anyone before the meeting. Hasluck approved the plan in principle and said funds would be forthcoming subject to a more detailed submission. Roscoe returned to PNG elated. Administrator Donald Cleland, however, was unimpressed, and Roscoe blamed Assistant Administrator John Gunther. Gunther was a powerful figure in the Administration. Under his directorship the Public Health Department had dominated the budget for years. Roscoe was now asking that Education be given the same priority, but Gunther was not prepared to support it. Roscoe was faced with an unconvinced Administrator, Assistant Administrator and other departmental heads – all intent on promoting their own interests. Mr Roscoe should have shown them his diagrams. Footnote: In late January 1965, after annual leave, I was flying back to Moresby from Sydney on the Electra and found myself sitting beside John Gunther, gruff but likeable enough. In those glorious days, you may recall, we all travelled first class. Of course I knew who Gunther was and felt a little awed to be in such close proximity to the great man. When the hostess offered us a drink, Gunther opted for neat Scotch. Though a beer drinker, I thought emulation would be the sincerest form of flattery, and also ordered whisky. “What’ll you have with it?” the hostess asked. “Dry ginger ale,” I replied. “No he won’t,” Gunther interpolated and, turning to me, offered a short lecture on the contaminating effect of mixers. Source: Letter from GT Roscoe to Loch Blatchford, 27 April 1982. See ‘The Blatchford Collection 1958' in ASOPA PEOPLE EXTRA. 1958 was a volatile year in PNG Education. Bill Groves, Director of Education since the end of the war, departed, with Territories’ Minister Paul Hasluck’s imprecations ringing in his ears. Groves' really never overcame his earlier association with former Administrator JK ‘Kanaka Jack’ Murray, a Labor appointee despised by the Menzies Government. Nothing Groves did ever satisfied Canberra. Geoff Roscoe, in the Territory since 1947, took over from Groves – and, while he seemed to interest Hasluck in his ideas, Roscoe's Port Moresby peers were far from impressed by his tactics in circumventing them. But ’58 was the year when a choice had to be made between universal primary education and a greater concentration on secondary schooling – and Roscoe came down in favour of the former. A critical decision. All in all, 1958 was arguably a vintage year, except perhaps for those involved. The 1958 papers in the Blatchford Collection, just posted on ASOPA People Extra, include an indignant repudiation of some ASOPA lecturers by a young acting District Education Officer in the swamps of the Western District. But he added: “There are instances of comment going so far as to suggest that postings to stations in this district and to some in the Sepik District are in the nature of ‘punishment postings’ and that they are ‘horror stations’. One lecturer even suggested that an officer should resign or refuse the posting if he were sent to Daru. My old mate Joe Crainean (seen here with wife Kathryn), who spent time at Oiyarip, Lake Murray and the Oriomo River, is living proof that three years in the Western District marshes didn’t do anyone too much harm. Although a recent remark by Joe that Tasmania's Arthur River "reminded me somewhat of the Oriomo near Daru" seems to indicate that, for old hands, the Western District looked more like civilisation every day. The first meeting of the new PNGAA committee was a great success. The 15 members present got through a lot of business and struck a new direction for Association activities over the next 12 months. The first issue addressed – the committee’s own structure - may seem bureaucratic but, to achieve its ambitious goals, the PNGAA must be capable of bearing the load of increased activity. To this end, five sub-committees were established, each with its own convenor to provide leadership, in these areas: Fellowship and Caring [Rbecca Hopper]; Papua New Guinea Relations [Robin Mead]; Publications and Communications [Andrea Williams]; History and Scholarship [Riley Warren]; and Finance and Membership [Ross Johnson]. Any reader interested in assisting with a specific area of sub-committee activity can contact the Association by email at admin@pngaa.net and indicate your willingness to participate. The committee meeting also agreed to establish a task force to review the PNGAA constitution, including how to the incorporate State and Territory branches in the formal structure of the Association. In due course constitutional change will require agreement from the entire membership, and there will be ample opportunity for discussion and deliberation before changes are instituted. ▪ The committee agreed to support the initiative of Chris Viner-Smith to seek Commonwealth Government recognition of former District Services personnel ['kiaps'] for their exemplary service to Papua New Guinea over a period of 75 years culminating with National Independence. I have written to Chris indicating this support. ▪ I was asked by the committee to write to Prime Minister Kevin Rudd urging the Federal Government to financially support the search for the Montevideo Maru, the declaration of the site of the sinking as a Commonwealth War Grave and the erection of a monument commemorating the tragedy. I have done this and issued a news release expressing the Association’s views, which was reported by Channel 9. ▪ The PNGAA has also supported a proposal from Paul Oates and Norm Richardson that the Federal Government establish an exchange scheme to enable young officers from the Commonwealth and PNG public services to exchange jobs for short-term assignments as a means of building understanding and transferring expertise between the two countries. I have written to the Duncan Kerr, the Parliamentary Secretary for Pacific Islands Affairs, on this matter. ▪ I have also written to Duncan Kerr urging the Federal Government to redevelop the former ASOPA site on Middle Head, Sydney as an Asia-Pacific institution dedicated to exchanging knowledge about important regional issues and improving relationships between peoples in the region. The new committee has hit the ground running in terms of its own affairs and that it is also moving to occupy a more strategic position in PNG-Australia relationships by engaging productively in proposing how the Australian Government may itself be able to do more and do better. As each sub-committee builds its own momentum, the scale and scope of the Association’s activities will intensify and broaden. I was leafing through the Pacific Islands Monthly for May 1963 when I happened upon this photograph. It shows the then station manager of Radio Rabaul, HH ‘Jim’ Leigh, posing in a studio with some staff members and two tape recorders. Jim was to become a rather bellicose and impetuous Controller of Broadcasting with the Department of Information. He plucked me from the ABC and into his managerial ranks in 1969. One of my tasks as the new manager of Radio Bougainville in 1970 was to recruit and train young Bougainvilleans to work as announcers and producers. I was under special orders to hire people from the dissident (secessionist) villages around Kieta. Jim Leigh, who later became general secretary of the Queensland National Party, called me on the radio-telephone from Port Moresby to proffer some unsolicited advice on how to conduct selection interviews. “Father,” he said (he called everyone father), “there are only three rules for selecting staff, and I want you to note them carefully. "One. Be rational not emotional. Got that, father? Over." I agreed I had got that. "Two. Put ‘em under pressure, real pressure. Know what I mean, father? Over." I affirmed I knew what he meant by real pressure. As chance had it, Jim was in Kieta for his annual inspection of the station at the time I’d scheduled a number of interviews. The inspection included intense scrutiny of the S-bend of the toilet, since Jim had recently had hepatitis and blamed unhygienic radio station latrines for this misfortune. He’d been unsettled by his arrival in Bougainville. The DC3 undercarriage warning light had triggered and there was some anxiety before an ultimately safe landing at Aropa airstrip. "Head between my legs, father. Thought I was gonna kiss my arse goodbye. Know the feeling?" I stated that, while the feeling was not known to me personally, I had a vivid imagination. Early next morning was interview time. The first was with a young hopeful from one of the dissident villages near Kieta. Jim reminded me of his three rules for conducting effective interviews - rationality, pressure and references – and told me he'd sit in to see how I conducted the session. I was unimpressed by this, but he was the Controller and I was his subordinate and that was that. The first applicant was a strikingly beautiful 18-year old woman. As she walked into my office, Jim simpered, “And what's your name, my dear”. “Pepi is short for Perpetua,” she breathed. “It comes from the English word 'perpetual' which means ….. everlasting." References on my desk in front of me, I was just about to ask the first rational question that I hoped would put Miss Tanaku under real pressure when Jim leapt to his feet. Photo (left to right): Matthais Tiamani, Jim Leigh, Nellie Exon, Joe Gohan, H Vue and Danes Tagi. The PNG Association has written to Duncan Kerr, the Parliamentary Secretary for Pacific Islands Affairs, supporting a proposal by two former patrol officers to improve governmental relationships between PNG and Australia. At its recent meeting, the Association backed the proposal from Paul Oates and Norm Richardson that the Federal Government establish an exchange scheme under the auspices of AusAid to enable young officers from the Commonwealth and PNG Public Services to exchange jobs for short-term assignments as a means of building understanding and transferring expertise between the two countries”. The exchange scheme - if appropriately developed, managed, branded and promoted in both countries - will provide the basis for the creation of peer to peer relationships based on mutuality not patronage. The Oates-Richardson plan is that the scheme must be reciprocal and involve the Government of PNG in the total process – from design to execution and evaluation - not as mere recipients of Australian largesse, irrespective of where the bulk of the money is sourced. Oates and Richardson emphasise the need for proper mentoring to support officers of both countries. They say this must be planned well in advance and preferably overseen by a committee made up of government and non-government members. The committee must ensure that time spent outside working hours does not drive participants into 'cultural ghettos' of their own country people resident in the host country. The entire program must aim for maximal learning about people and culture and seek to develop appropriate networks and long lasting contacts within and outside government. The PNG Association, through Paul Oates and Norm Richardson and other members, is willing to provide support for this initiative and to engage other entities, such as Rotary International, that may be able to assist. Was there a Rabaul atrocities cover-up? 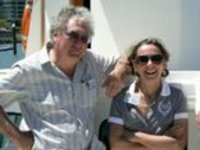 I READ with interest the article on the loss of the Montevideo Maru and wish to share the following regarding one of those presumed to have been lost on the ship - Harold Hillis Page [left] who was acting Administrator in Rabaul at the time of the invasion. I was a kiap from 1968 to 1981 in a range of positions across the country. I went there to see what my father had done during World War II with the 2/14 Battalion. As secretary of the Battalion’s post-war Association, I was contacted by Albert Speer, formerly Deputy Director of Health in the pre-Independence administration. He was enquiring after the verification of facts behind a wartime photograph of a temporary cemetery of 2/14 Bn soldiers at Gona. Albert had been a medical orderly required to visit the coastal region after the Lamington eruption to investigate possible resettlement sites for survivors of the eruption. He came across a cemetery similar to the one in the photo that he was advised contained the bodies of approximately 12 Europeans who were alleged to have been brought over from Rabaul with the initial invasion fleet. Whilst it is well known that many Rabaul nationals were brought over to act as carriers for the Japanese troops, Albert's source who was one of the survivors and had become a policeman, advised him that there were about a dozen Europeans brought across as well to advise the Japs on conditions, tracks and locations on the route to Port Moresby. One of these was alleged to be Page. Apparently they refused to cooperate and were executed at Gona and their bodies left in the bush. The Gona villagers then quietly buried them for the duration of the war until the Japanese were defeated and then formalised the cemetery. The various temporary military cemeteries in the area were mapped when created and, at the end of the war, the bodies disinterred and relocated to Kokoda first then Bomana by the War Graves Commission. Our Association could not help Albert as my father considered the photograph was that of the military cemetery it claimed to be. He had very vivid memories of Gona and the cemetery. As a military historian, I have read much on the fall of Rabaul and it is well considered that the Japanese used the loss of the Montevideo Maru to cover up many of the war crimes committed in the weeks after the fall of the town. It is alleged that many soldiers and civilians executed at Tol and other locations had their names added to the manifest of the ship after it was sunk in an attempt to cover up the war crimes. Harold Page is alleged by Albert to be one of those names due to his belief in the veracity of what he saw and was told after the Lamington eruption. The Papua New Guinea Association has formally come out in support of the former ASOPA site being redeveloped as a regional institute in which Asia –Pacific participants, including Australians, seek to examine and develop solutions for critical issues facing the region. 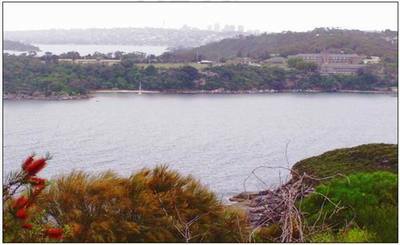 The heritage listed buildings on Middle Head are about to be refurbished but, as yet, no future purpose has been identified for them. The PNGAA has written to Duncan Kerr, the Parliamentary Secretary for Pacific Islands Affairs, saying it supported “the proposal to redevelop the former ASOPA site on Middle Head, Sydney, as an Asia-Pacific institution dedicated to exchanging knowledge about important regional issues and improving relationships between peoples in the region”. The PNGAA management committee has no illusions about how difficult this challenge is, but felt it was imperative that it have a go. Ninemsn, the online presence of the National 9 News, today features coverage of the Papua New Guinea Association’s appeal to the Australian Prime Minister to instigate a search for the wreck of the Montevideo Maru. The Papua New Guinea Association of Australia has urged Prime Minister Kevin Rudd to commit the government to a search for the sunken warship Montevideo Maru and the 1053 men she carried. The sinking of the Japanese war vessel by an American submarine off the Philippines coast in 1942 remains Australia's worst maritime disaster. "The sinking of the Montevideo Maru has special relevance for anyone associated with Papua New Guinea,” PNGAA President Keith Jackson said. "Most of the 208 civilians who died were Australians who considered the Territory of New Guinea ... to be their home. “The PNGAA has asked Mr Rudd to financially support the search for the Montevideo Maru, declare the site of the sinking a Commonwealth War Grave and erect a monument at an appropriate place on the Philippines coast as a permanent memorial." When ASOPA PEOPLE published the poem ‘Anzac on the Wall’ on Anzac Day, we set off a chain reaction amongst readers, who are still accessing the poem on the website two weeks later. I’ve been in touch with the poet, Jim Brown, and here’s the story of how the poem came to be written - KJ. The story behind the Anzac on the Wall is that I was a TV journalist and, in 1990, went to Gallipoli to cover the 90th anniversary of the Anzac landing. Before I went, I visited the Military archives in Canberra looking for photos for a documentary film, and a lovely old man put a cardboard box in front of me which contained letters written to and from the war front. The letters could not be identified, and therefore could be returned to the families. I made notes at the time and later in life became a bush poet. The trigger for the poem was the photograph of the Anzac on the Wall, which I have in my possession and carry it with me when I perform the poem. The photo led me to incorporate the information I had gleaned from the letters. The suffering of those waiting at home had not been written about enough, and time and again it seemed that those close to the land knew the very instant they had lost a loved one on the other side of the world. From those letters I wrote about the lightning storm, the horse bolting etc. I am humbled by the fact that so many people have been moved by the poem, especially around Anzac Day. I have recorded the poem on CD, with other Australian classic and original poems. The cost is $25 which includes postage etc. You can contact Jim by emailing him here. The Papua New Guinea Association of Australia has asked Prime Minister Kevin Rudd to commit the Commonwealth Government to an expedition to locate the last resting place of the Montevideo Maru and the men she carried. The sinking of this vessel in the South China Sea off the Philippines in the early hours of July 1942 claimed the lives of 1,053 Australian troops and civilians who had been interned in Rabaul. It remains Australia's greatest ever maritime disaster. The sinking of the Montevideo Maru has special relevance for anyone associated with Papua New Guinea. Most of the 208 civilians who died were Australians who considered the Territory of New Guinea their home. Whilst women and children were evacuated, the men had to remain at their places of employment in the New Guinea Islands leading up to the Japanese invasion. They came from all walks of life, administration officers, school teachers, planters, missionaries and traders; they were of all ages (the youngest a youth of 15); and many had seen prior service in World War I before moving to New Guinea. The PNGAA has asked Mr Rudd to financially support the search for the Montevideo Maru, declare the site of the sinking a Commonwealth War Grave and erect a monument at an appropriate place on the Philippines coast as a permanent memorial. I've provided Mr Rudd with a list of the civilians who died aboard the ship. As I found, merely to read their names, ages, occupations and places of work, personalises the tragedy in a most poignant way. Along with the PNGAA media release, you can find the list here [Download Montevideo Maru.pdf]. John Mansell Biltris died on 20 March 2008 in Melbourne. He joined the PNG Administration as a Cadet Patrol Officer on 27 February 1961 and served at Gumine in Chimbu thence in various parts of PNG in local government positions. He became town clerk of Lae in 1972 and returned to Australia in 1974. John was diagnosed with bowel cancer three years ago and underwent treatment. The cancer had unfortunately spread to his lungs and liver, and he was due to commence further treatment at the start of 2008. He decided to make a farewell visit to Gumine first. The people of Gumine, south of Kundiawa, were a big part of John's life. He had visited them a couple of years earlier and then financed a reciprocal visit to Melbourne of John Dai, the son of traditional leader Kuman Dai, and his wife Helen. Between them, the two Johns organised some small civic projects around Gumine. John was regularly shipping books for the school and clothing to the area. During his retirement, John enjoyed indulging in one of his favourite pastimes, garage sales, and never ceased to amaze his family with the treasures he scored. It was at garage sales that John collected many of the books and other items he sent to the people of Gumine. John returned to Melbourne from his last visit on 13 January and was admitted to hospital the next day. He was courageous in his battle and was determined to overcome his illness, but unfortunately remained in hospital until his death. John is survived by his wife of 42 years, Barbara, his two children, Andrew and Fiona, and two granddaughters, Jaymie and Danielle. The Sydney Wantoks club was largely instigated by Papua New Guinean students at the University of New South Wales who would gather at weekends to socialise. As numbers grew, it was decided to formally establish the Club at the end of 1993. It was first registered with the Students Union of the University of NSW and, in 1995, began to operate independently. The club was incorporated in 2003. The objectives of Sydney Wantoks are to assist new residents, students and their families to settle into Sydney and to maintain contact between them. This includes assistance in locating suitable accommodation, providing essential household items, advising on medical treatment and assisting socially, financially, spiritually and in times of emergency. The club organises social functions, promotes cultural awareness through dances, traditional food tasting and craftwork and sends goods and money as emergency relief when PNG is affected by natural disasters. You can find the website here. It has a range of features including a photo gallery with some alluring pictures of a pig feast, Sydney style. I’m sure the Sydney Wantoks would welcome you as a member if you want to get in touch through their website or by sending an email through this link. Photo: The PNG flag is flown proudly at a Sydney Wantoks Independence Day event in the city's Centennial Park. So begins an article, with this exceptional accompanying photograph of the ASOPA grounds, in the most recent issue of Mosman Magazine. The story [right] reports that the Harbour Trust is to soon begin to refurbish the buildings and is currently investigating the history of ASOPA through its oral history program, in which I and a number of readers have participated. If you have a story to tell about ASOPA or ITI, contact Eunice Sarif on (02) 8969 2100 or email her here. Paul Oates and Norm Richardson’s proposal that the Federal Government establish an exchange scheme to enable young officers from the Commonwealth Public Service and the PNG Public Service to exchange jobs on short-term assignments will be discussed at tomorrow’s meeting of the management committee of the PNG Association. It’s a great idea that, if accepted, will go a long way to building understanding and transferring expertise between the two countries. While there are a couple of existing schemes that look a bit like this one, the Oates-Richardson scheme is much more comprehensive. The New Zealand government will run a program for PNG diplomatic officers starting this month. And the National Judicial College of Australia will train PNG’s 100 magistrates in a program that will start later in the year. But both of these initiatives, useful though they are, are straightforward programs in which New Zealanders and Australians train Papua New Guineans. They lack the reciprocity and mutuality of Oates-Richardson. The two ex-kiaps have proposed a scheme that pitches right in the slot and it’s to be hoped the PNG Association can give it the support that will help build a bit of momentum. The Papua New Guinea Association of Australia (PNGAA) has elected former PNG teacher and NBC executive Keith Jackson as its new president. Mr Jackson taught in Simbu from 1963-66, worked with the ABC and the department of Information, managed Radio Bougainville from 1970-73 and finally was the NBC’s first head of policy and planning. “I feel strongly that the association should be active in strengthening relationships between the people of Australia and Papua New Guinea,” Mr Jackson told the PNGAA annual general meeting. He was awarded the PNG Independence Medal in 1976 and the Order of Australia (AM) in 2004. There’s a truism about new organisations, and about new leadership in old organisations. And it is this. The way you begin tends to be the way people believe you are. It’s all about perceptions. The first meeting of the new committee of the Papua New Guinea Association of Australia is to be held this coming Sunday – and I hope the association will be, and will be perceived as being, a 'can do' outfit. ▪ Adapting the PNGAA’s structure for the job ahead. ▪ Take some early policy decisions in areas where the PNGAA’s weight may make a difference. Structurally, as I’ve mentioned here before, I want to establish working groups in each of five key areas: fellowship & caring; PNG relations; publications & communications; history & scholarship; and finance & membership. We’re in the process of appointing competent convenors to lead each of these groups. On Sunday, it’s expected that each group will develop a work plan to guide its activities in 2008. I also want to start a process of constitutional review, especially to determine how State and Territory branches may be better linked with the parent PNGAA organisation but also to refine the structure of the Association to equip it for an expanded future role. ▪ To write to the Prime Minister urging the Federal Government to financially support the search for the Montevideo Maru, declare the site of the sinking a Commonwealth War Grave and erect a monument on Subic Bay to mark this maritime tragedy. This project has great meaning for many Australians and expecially for people associated with Rabaul, from where the ship departed on its last tragic voyage. ▪ To support Chris Viner-Smith’s initiative that former PNG District Services personnel [‘Kiaps’] be formally recognised by the Commonwealth Government for their exemplary service to the people of PNG over a period of 75 years culminating with National Independence. Some ex-kiaps are a bit embarrassed by all this fuss, but as an ex-chalkie I reckon they deserve some recognition by our Government. ▪ To support a proposal that the Federal Government establish an exchange scheme to enable young officers from the Commonwealth Public Service and the PNG Public Service to exchange jobs on short-term assignments as a means of building understanding and transferring expertise between our two countries. This idea came from Paul Oates and Norm Richardson and I reckon it’s one of those good practical suggestions that can make a difference. ▪ To ask the PNGAA to lend its support for the ‘School of the Pacific’ proposal – to reinvigorate the old ASOPA site with a new and relevant purpose to strengthen Australia’s relationships with PNG and the Asia-Pacific region. I’ve been banging on about this for a while [see ASOPA Site under 'Categories' at right]. I invite you to offer a comment on these or any other matters so PNGAA committee members and ASOPA PEOPLE readers can share your thoughts. You can join the PNGAA and make it a stronger organisation by clicking through to the application form here. Membership is only $20 a year. Chris Viner-Smith’s book, Australia’s Forgotten Frontier, reminds us that, in addition to many other duties, the Kiap was also a commissioned officer of the Royal Papua & New Guinea Constabulary, with the rank of Sub Inspector; although with no uniform or badge of office. Viner-Smith was 19 years old in 1961 when he responded to an Adelaide newspaper advertisement for the position of ‘Cadet Patrol Officer, Territory of Papua and New Guinea – Training Provided’. His application was successful and his experiences in PNG until 1971 provide the basis of this book. “[These experiences] could be described as the origins of international deployment of Australian Police to overseas countries,” writes reviewer Mick Barnes. In 1964, the PNG-West Irian border. Smith details his experiences of having to confront large groups of Indonesian troops who had crossed the border and attacks on his police patrol by local tribes. Both reviewers agree that Viner-Smith has written an interesting book that makes enjoyable reading.